Northern Mexico is mostly hot and dry. There are temperate regions that get some rain, and winters occasionally bring snow, but for the most part, the snakes you are going to find there will be comfortable in a warm environment without an over-abundance of water. 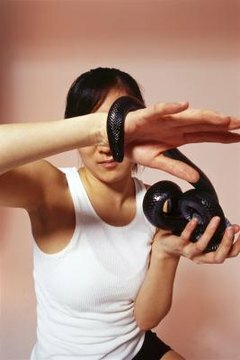 These include the Mexican black kingsnake, coral snakes, several rattlesnakes and ground-dwelling shovel-nosed snakes. The black kingsnake is a constrictor native to northwestern areas of Mexico and some places in the southwestern United States. It's a shiny black snake that reaches about 4 feet in length. This snake poses no real threat to humans, and because of its docile nature and attractive scales it's a popular pet. Its diet, like most constrictors, consists of small rodents, reptiles, amphibians, birds and eggs. The best place to see them is in the Mexican state of Sonora. The western coral snake can also be found in the Sonora area. Coral snakes can be found all over the Americas. They are all poisonous and marked with a combination of red, black and yellow or white stripes. While no deaths are known to have been caused by its bite, this snake does have a powerful venom that can make a victim very ill. They're not large -- less than 2 feet long and pencil thin. There are snakes that mimic the western coral's coloration, but the western coral can be easily identified by the red bands bordered by yellow or white. The most dangerous snakes in northern Mexico are the rattlesnakes. There are several species, including the Sonoran sidewinder, the ridge-nose rattlesnake and the tiger rattlesnake. They are rarely aggressive, but can also be territorial and may attack if threatened. Fortunately, even if you do not see them, rattlesnakes usually warn intruders with their audible tail rattles. In northern Mexico, their coloring tends to be subdued browns and tans, to blend in with the dry, rocky regions where they live. They vary in size from about 1.5 feet to 3 feet long. The Sonoran shovel-nosed snake takes advantage of a very similar coloration to that of the coral snake. It's roughly the same size and has yellowish, red and black markings, but the red saddles do not encircle the body the way a coral snake's bands do. It can also be distinguished by the flat, cream-colored nose that it uses for burrowing. The coral's nose is black. This snake spends a lot of its time underground and feeds on spiders, centipedes, scorpions, small reptiles and various insects.